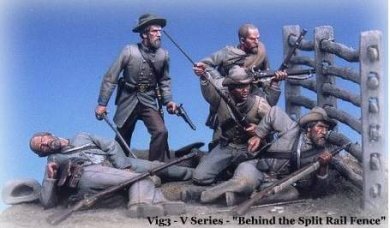 Why does an Australian model maker produce American Civil War miniatures? The inspiration for the range comes from Paul Clarke's interest in the history and soldiers of the Civil War and subsequently, the photos, paintings and sculpture of the period. Coupled with his interest in model-making and military miniatures, Paul's objective is to produce the most comprehensive range of Civil War figurines available. The figures shown on the web site were painted by Paul, some of the Confederates shown, forming part of his original display at the 1992 Valley Forge show. Paints used are predominantly Hobby enamel (Humbrol), mixed with Artist Oil Colours for various effects. The techniques used are similar to those employed by famous modellers Shep Paine and Bill Horan. Some of the figures and vignettes shown have won medals at various model exhibitions including Euro Militaire, Chicago MMSI, Washington and Paris World Expos. Gifted sculptors Julian Hullis of England and Dr Andrea Iotti of Italy have both been commissioned to provide horses for the Shenandoah range and further cavalry figures are planned for the range. 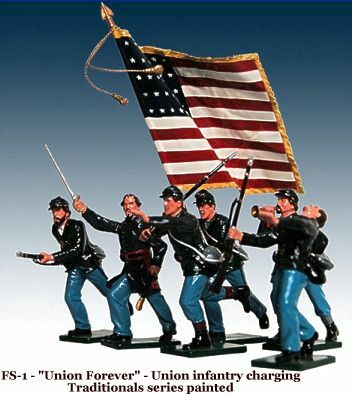 Another exciting new release has been the gloss painted boxed sets "Traditionals" Civil War Toy Soldiers. Catering for the adult traditional toy soldier collector, the figures are adapted from the existing kit range and hence offer a high level of detail and anatomical accuracy. Painting standard, although in the conventional Toy Soldier style is exceptional with quality and finish being the prime objective. Each year, Paul travels to modelling shows and exhibitions throughout the world to display new Shenandoah releases and maintain contact with fellow producers and collectors. There is still a lot of new figures to sculpt and many new releases are planned!